Celebrate the start of Toronto design week at TO DO’s Festival Party! Join designers, architects, artists, craftspeople, and VIPs at a launch event that draws attendees from around the world. Mix and mingle in the historic Church of the Holy Trinity* while enjoying, drinks, music, and an installation created by the Design Fabrication Zone, Ryerson University’s interdisciplinary incubator for design and fabrication. Don’t miss TO DO’s inaugural outdoor installation ‘Resurfacing Taddle Creek’ in Trinity Square Park, just a few steps from the Festival Party. The installation, designed by North Design Office, resurfaces the rich history of Toronto’s Taddle Creek by animating a portion of its path that lies underneath Toronto city streets. *Due to venue capacity, ticket holders may not bypass the admission line. To ensure entry to the event, please arrive early. Please ensure to bring government issued ID for bar access. Pneu is an immersive pneumatic environment created from the exploration of form-finding, and continual air pressure. The geometric constraints and transparent properties of plastic sheeting reveal a convex mylar pillar. 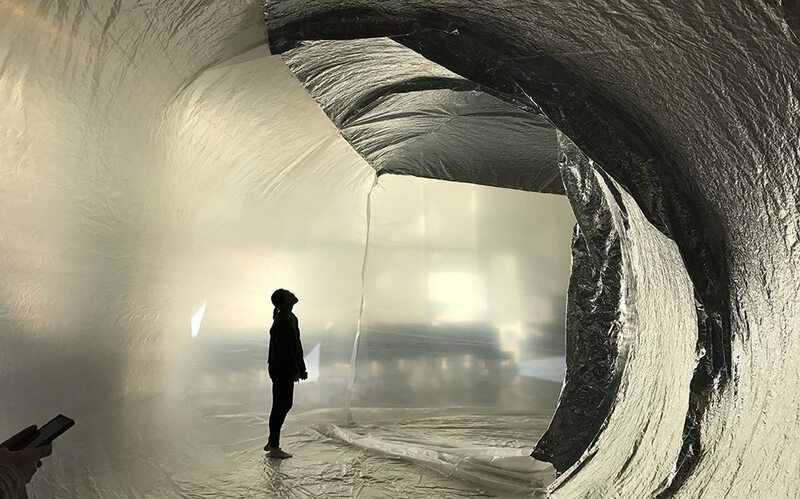 This inhabitable environment invokes the curiosity of the user from afar as they watch others place themselves within the installation. The properties of light, colour, and opacity combine to consume the individual in an unconventional spatial experience.